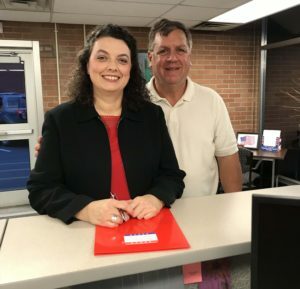 Johnston County Clerk of Court Michelle Ball submitted her paperwork Friday afternoon for a second term. She was joined by her husband Jerry as she turned in paperwork at the Johnston County Board of Elections Office in Smithfield. Ball was first elected in 2014 replacing former Clerk of Court Will Crocker who did not seek re-election. Ball oversees a staff of 43 employees. As an active member of the Conference of Clerks of Superior Court, Michelle serves as the Chairman of the Resource Committee and as a member of the Legislative and Technology Committees. She is also a member of the North Carolina Guardianship Association and the National College of Probate Judges. Michelle and Jerry, a local land surveyor, live in Smithfield and have 4 children. She is an active member of First Baptist Church in Smithfield where she teaches Sunday School to 5th and 6th graders.